North Korea has said it could return to talks on its nuclear disarmament in exchange for a peace treaty with the US and an end to sanctions. The 1950-53 Korean War ended in a ceasefire but not a peace treaty. The North's statement came as a US envoy said Pyongyang must improve its "appalling" human rights record if it wants better relations with the US. Robert King, the US special envoy for North Korean human rights, is on his first official trip to South Korea. In a statement carried on North Korea's official news agency, the foreign ministry said: "It is essential to conclude a peace treaty for terminating the state of war, a root cause of the hostile relations" between Pyongyang and the US." The North has previously said it could return to the six-party talks on its nuclear programme, but these are believed to be the first conditions that it has set out since the chief US negotiator on the North's nuclear programme, Stephen Bosworth, visited Pyongyang in December. Mr Bosworth carried a letter from US President Barack Obama calling on North Korea to return to the nuclear talks. The foreign ministry statement said talks on a peace treaty could be held as part of the six-nation talks, or separately. The statement came as Mr King described the North's human rights situation as "appalling". He said human rights must be addressed as part of stalled six-party talks. "It's one of the worst places in terms of lack of human rights," he said on the first day of a fact-finding visit to South Korea. "As we have said on many occasions a relationship between the US and North Korea will have to involve human rights," Mr King told reporters after meeting Foreign Minister Yu Myung-Hwan. "To improve relations between the US and North Korea will have to involve a greater respect for human rights by North Korea. That's one of the important conditions," he said. Pyongyang pulled out of talks on ending its nuclear programme last April following widespread condemnation of a long-range missile launch. International pressure grew following a nuclear test in May - which drew UN sanctions and further missile tests. But in December, North Korea said it would work with the US to "narrow remaining differences" following a visit to Pyongyang by US President Barack Obama's special envoy Stephen Bosworth. 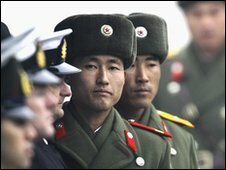 The six-party talks bring together the two Koreas, the US, China, Japan and Russia.